Another election, another win, another loss, another dispute, another positive endorsement by the 'international observer teams,' and another litany of condemnation by locals for a poor show, another round of killing and maiming of protesters. The just concluded Kenyan election has followed the script of African elections to the letter! The most significant part of this election is in the house of Parliament. Out of 290 MPs, 179 will not be returning to Parliament. That makes a failure rate of about 62 per cent. Uganda has a similar story. Plainly speaking, Parliament has become a fool's paradise. The cycle begins with the one who wants to replace an incumbent. He puts a huge amount of money together. He talks big and promises paradise. He buys his way (bribes voters) there on the understanding that he will recover his deposit from the fat salary and allowances that is for those who become MPs. Then he faces the reality. In most African countries, the theory of the workings of the State has been bastardised. The chief executive has swallowed everything and apparently he is the only effective arm of government. He, like a conductor of an orchestra, can choose when to be effective and when to be deficient. So he programmes his government to finance schools, hospitals roads and other social amenities for the pleasure and perpetuation of the incumbent. If the area is hostile they get zilch. They are held at ransom. Show the president some love and you will have what you want. The poor MP whose job is legislation and oversight, then becomes the State. He must deep his hands in his pockets to provide roads, pay hospital, school, funeral and wedding bills if he wants to retain his seat in the next election. Eventually they burn out and are left in debt. Unlike the President, they don't control the entire State machinery to help them retain their seats. It is then time for the electorate to 'get themselves another fool' as black American Sam Cooke sang so beautifully way back in 1963. What about the silent voter in the African election? Many times we do not factor in the foreign investor and, most especially, the donors. If an incumbent, however lousy he is with the citizens, is considered good enough by investors and donors, then they are good, however bad the election is. The observers of the elections fell over each other to praise this particular election as an example to the rest of Africa even when a key election official was killed a few days to the election. Africa is destined for disaster as it borrows to fund its growth and enrich those in power to stifle the efforts of those who contend with them for power. Donors will one day come back for their money which is being squandered by those in power. That is when we shall get the entire story of why they don't seem to care whether the money is used prudently or stolen. They keep pumping it in. The quality of elections doesn't seem to bother them in case the incumbent is a good client. He keeps the aid project going and secures the deposit of the donors. When opposition parties speak against waste and returning the country to its citizens and so on, they are threatening the interest of the silent voters ie donors and investors. The silent voters then finance the incumbent. It is hard to remove a sitting president. Raila Amolo Odinga, 72, has lost a presidential election on the fourth time of asking (1997, 2007, 2013 and 2017.) 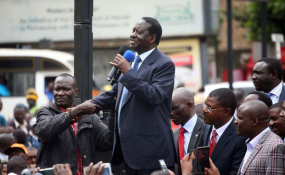 Now in defiance, he has called on his supporters to stay away from work as a protest for what he calls massive rigging by eventual winner Uhuru Kenyatta. This is another solution that leaders who feel short changed in an election propose to their supporters. Mass action rarely works in these parts of the world. The typical African leader starts sorting that matter out when he steps in office. As Bob Marley sung in his Reggae tune, One Drop, 'they make the world so hard... ' Under his watch, agriculture, the main stay of the majority fails. The people lose their land to land grabbers and end up bitter, wallowing and hustling in urban poverty. Many of these are the types who vote for the opposition that promises them a better tomorrow. In Kenya, many of these are the slum dwellers like you have in the opposition strongholds of Kibera and Mathare. They live from hand to mouth. They have to work for a pittance from Sunday to Sunday to keep their skins and that of their kith together. Keeping away from work even for a few hours is a threat to their existence. Those in government are quick to point out that the politicians asking them to stay away from work are rich and secure; living comfortably eating sausages and sleeping on soft beds. After one or two days of protest and with the brutality of the police visited on them, these protests die out. Raila Odinga and the opposition have a mountain to climb. It is very hard to remove a sitting president.